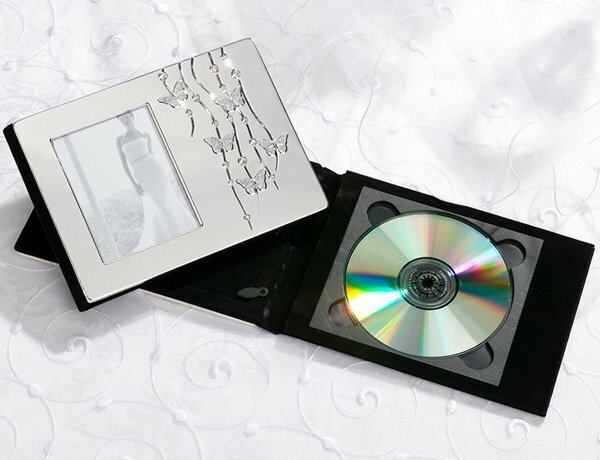 Where will you store your wedding DVD? Once the videographer hands it over to you in a plastic case, you'll want to transfer it to someplace much prettier and sturdier. The silver-plated cover of this 8" wide CD/DVD holder is engraved with butterflies and vines. Rhinestones are used to accent the design. A picture frame adorns the cover. Add in your favorite wedding snapshot. The inside is lined in black velvet and has a holder for one disc. You'll always remember where you put your wedding DVD. Also, nice to gift parents of the bride and groom with their own copy of the wedding. Coordinates with guest book, pen holder, and marriage certificate holder (search for 710). A sweet way to secure your treasured wedding memories.